The month-long exhibition CMYK by artist Michaela Zimmer opens this week at the up-and-coming FOLD Gallery in Fitzrovia. Although this is the German artist’s first solo exhibition in the UK, it’s apparent upon viewing that there is something visceral about Zimmer’s work. When asked on recurring themes in her art, Zimmer said that “Physicality through expression and movement of the body” has remained her inspiration. Various mixed media often drape her canvases, with plastics stretched and twisted around the corners. 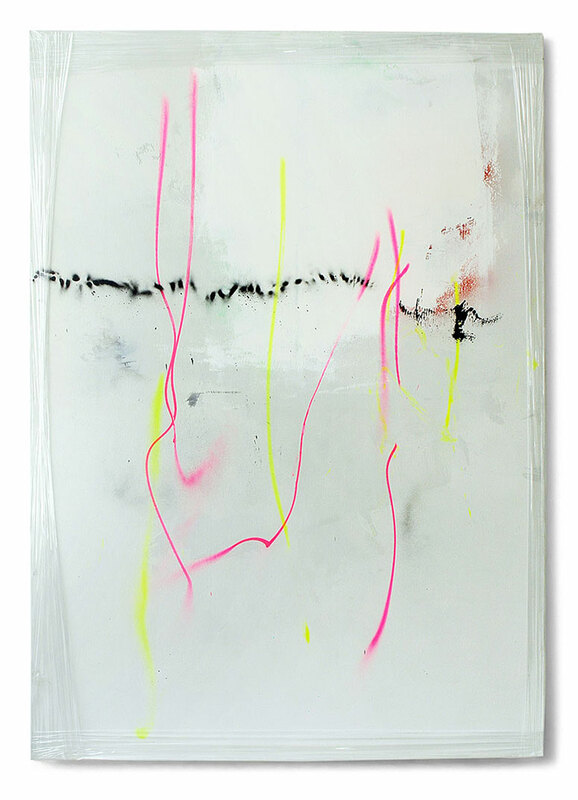 Most of the pieces in CMYK consist of layer upon layer of acrylic, lacquer, spray paint, and PE film. The vibrancy of these pieces are in sharp contrast to the white space of the FOLD. Performance photography has been the foundation of Zimmer’s career. When she turned to painting and sculpting, she used these elements of staging — continuous painted lines are applied in one stroke, with dashes and reflections that often form a surface that is fluid but also precise. When she reflects on her creative process, Zimmer indicates the state that she goes into both mentally and physically when focused on a particular movement or gesture. She uses this energy in the studio, often working on multiple pieces at once. Although her paintings are abstract, materiality and mark making, which invite us to focus on the body of a piece, are predominant. Zimmer never allows any two of her works to appear the same, and her pieces benefit a great deal from being viewed from different angles. The transient nature of her surfaces encourages viewers to react to the works’ physicality, which, in a way, reflects the origin of its creation. The exhibition CMYK runs until March 26, 2016. FOLD Gallery, 158 New Cavendish St, London, W1W 6YW.